Local beans and grains company expands across N.Y.
With the rise of the movement for local and organic food, local consumers are beginning to question where their food comes from. While some commercial products hail from California or Florida, many come from outside the United States. But one local company is working to make a loaf of bread or a bean burrito closer to home. Brooktondale’s Cayuga Pure Organics — founded by Erick Smith and Dan Lathwell in 2003 — provides organic grains and beans to restaurants, markets and distributors all over the state, from New York City to Ithaca College’s own Terraces Dining Hall. Since then, the company has expanded to provide products throughout the state. “When we started, we were really just based in Ithaca, and we sold a lot to the community and restaurants,” Clancey said. “We started branching out to Rochester, Utica and Syracuse, and we looked at New York City as definitely a potential market for us.” The lack of farms offering a similar service, and consumer desire for fresh, healthy food in the city encouraged further expansion. The farm specializes in several different kinds of grains, from the standard wheat, rye and oats to what food enthusiasts call “ancient grains.” As the name suggests, these grains have survived millennia with virtually no genetic change, whereas modern grains have undergone generations of selective breeding. Cayuga Pure Organics grows spelt and freekeh, which is harvested while still green and roasted to make a cereal-like food. Rather than milling its own grain, Cayuga Pure Organics works with Trumansburg-based Farmer Ground Flour. Started in 2008 by Smith, miller Greg Mol and Thor Oeschner, a grain farmer in Newfield, NY, Farmer Ground Flour takes the grains grown by the two farms and mills a variety of flours. In addition to the standard whole wheat and high-extraction “half-white” flours, the company produces corn and special-batch rye flours, and these are given back to the farms to sell to clients. Cohen said he began using the farm’s flour because: “[I] always wanted to use local wheat and they had the ability to grow it, so we needed to come up with a bread that was fitting for it, take the New York State wheat and come up with something spectacular.” The Ultimate Whole Wheat was born from this concept as well as the 100 percent whole-wheat flour, and it has been a top seller since. He also makes spelt bread and ale bread using Cayuga Pure Organics grains and maintaining the Old World style of wet doughs and long fermentation times. Orwasher’s sells their breads throughout the city in venues such as Zabar’s and the farm’s stand in the New York City Greenmarket. A wide selection of beans is grown as well, ranging from heirloom varieties to the more common black, red and pinto. In 2005, GreenStar Natural Foods Market asked Cayuga Pure Organics about growing dry beans to provide a local source. Greenmarket then also contacted the farm because they did not have anyone selling dry beans. The farm began selling both bean and grain products at the Union Square Greenmarket in 2009 and have remained popular since, expanding to seven markets in New York. “People really loved what we were bringing, and we had a unique product that nobody else had, so it has grown incredibly fast,” he continued. Though the size and lack of manpower limits expansion, Cimino hopes to also use Cayuga Pure Organic flour in the future, primarily for desserts. Choices vary by day, but the main sellers are espresso ganache brownies and churros with a spicy dark chocolate sauce. 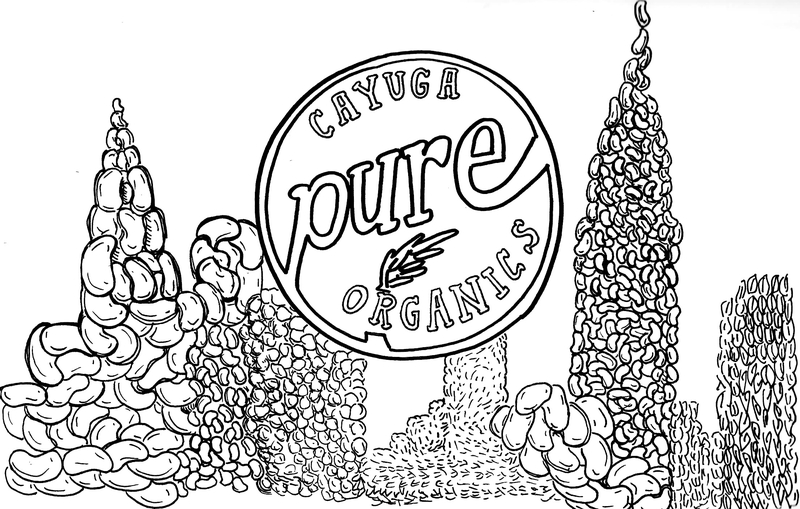 Many schools are also working with Cayuga Pure Organics to provide local, healthy products in dining services. Currently the farm supplies grains and beans to Colgate University, SUNY Oswego and the Ithaca City School District. Denise Agati, interim director for the ICSD Child Nutrition Program, said the partnership with the farm began two years ago with black beans. The school district worked with Amie Hamlin, executive director for the New York Coalition for Healthy School Food, as well as Moosewood Restaurant to develop bean-based entrees. The first recipe developed was a vegan Mexican fiesta lasagna, which featured a layering of the Cayuga Pure Organics black beans, tortilla chips and sauce. “We took the first recipe and started taste-testing at Boynton Middle School’s International Night, just to get a new flavor out there,” Agati said. Among the many benefits of buying local include the healthfulness of the products. Locally-grown products require less travel time and can undergo less processing, and according to Clancey, many restaurants don’t go out of their way to advertise their use of local products — “they just like using fresh ingredients.” Despite the local focus, Cayuga Pure Organics has gotten orders from across the country as a result of their online ordering system, often because the company fills a niche that not many do. “We’ll have people call from Mississippi, California, all over the country,” Clancey said. “They swear that they’ve looked as hard as they can and can’t find anything more local than us.” Recently, the farm has expanded to distributors in Philadelphia and New England to fill the demand. As for the economic impact, buying local protects the integrity of the financial state of the region because the money starts and ends locally. “I really enjoy the fact that I have that connection to the farmer,” Cohen said. Amanda Hutchinson is a freshman journalism major who prefers her ancient grains fossilized. Email her at ahutchi2[at]ithaca[dot]edu.